Jaisalmer Fort or Sonar Quila : Built by Rajput king Rawal Jaisal 850 years ago, this is a ‘living fort’ that houses 3,000 inhabitants. Wrapped in three layers of stone and guarded by 99 bastions, which lend it its unique appearance, the fort is home to descendants of the original inhabitants of this once fortified city. For the gleeful traveller, the fort is packed with guest houses, many of which offer stunning vistas of the town and surrounding countryside. There are many hotels in the town below and a number of super-luxury hotels and resorts on the fringes of the city. Budget for an entire day to explore the fort. There are three main complexes of historic importance – the Raj Mahal or King’s Palace, Rani Mahal or Queen’s Palace and a cluster of ancient Jain temples dating back to the 12th and 15th centuries. Although you will be hounded by guides offering their services, opt for the audio guide for the best immersive experience. Once you’re done with history, it’s time for some kitsch. Sonar Quila is a honeycomb of narrow lanes draped in all manner of textiles and adorned in other products, advertisements for a range of tempting wares. Traditional attire is most popular but stalls hawking leather wear, brassware and even a bookshop entice the visitor to browse through their touristy treasures. Sand Dunes : The Sam Sand Dunes are most popular but you might want to visit the dunes at Khuri for an alternative experience. And here’s a secret. There are other, more low-profile, camel trails that wend their way up the dunes. These routes offer a more authentic experience, and in off-season, even some much-needed solitude. Here’s a tip for the uninitiated traveller. You may book a trip to the dunes either through your guest house or hotel. Or if you hire a vehicle to take you there, your driver will likely lead you to a camp he regularly liaises with. So you can make it up as you go. Here’s another tip. The ‘dunes experience’ can be anything from a singular camel ride to an evening that comprises a ride up the dunes followed by folk entertainment and dinner. For those keen on a more comprehensive experience of the best Jiasalmer has to offer, there are numerous desert camps that set up tents among the dunes, where you can stay for as many days and nights as your wallet allows. The more adventurous may opt for a camel trek that lasts several days! It’s all very organised and perfectly safe – but the mark-ups for the camps can be ludicrous, so bargain hard. And don’t worry if you don’t pre-book. 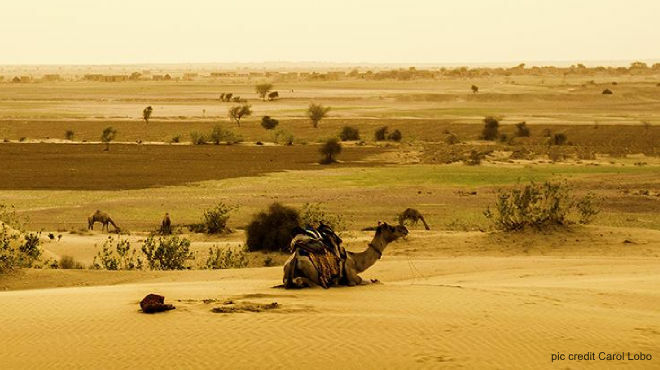 There is no dearth of people in Jaisalmer who can organise these expeditions for you! Sam Sand Dunes and Khuri are each located 40 km from the city. Gadisar Lake : Located on the edge of the town and developed more than 500 years ago by Maharawal Gadsi Singh, the lake was once a reservoir for the arid and parched town. With two beautifully carved stone cenotaphs in the middle of the water, this spot makes for great photo-ops. It is flanked by temples and small shrines to the left but it is the desert that lies straight ahead that mysteriously beckons. You can walk right around the lake’s perimeter and, if you have the time, explore the area beyond before coming full circle. Due to Jaisalmer’s proximity to the Bharatpur Bird Sanctuary, and depending on the time of year, migratory birds pause to a drink at the lake before making their onward journey. Bada Bagh : After spending a day sampling the flavors of Sonar Quila, head out 6 km from the town to Bada Bagh or literally, Big Garden. Don’t be fooled by the name. Hauntingly beautiful and covered in honey hues at sunset, Bada Bagh is a rocky outcrop that houses the cenotaphs of Jaisalmer’s rulers. Lured by the drama of the sand dunes, most tourists give this oasis of calm a miss, so you will likely be the only visitor here. Framed by these intricately carved, imperial memorials as the sun slips below the horizon, this is a good place to contemplate life and the universe. Desert National Park : This one’s a must for wildlife enthusiasts or even just nature lovers. Covering 3,000 sq km and comprising craggy rocks, salt lake bottoms and sand dunes, the Desert National Park is known most notably for sightings of the Great Indian Bustard, especially in winter. It is a haven for resident desert birds and animals and definitely recommended. Book a jeep safari and let the flora and fauna put on their best show. Tip: While resident birds and animals can be spotted year-round, migratory birds make an appearance only in winter. Caution: Avoid a jeep safari in summer. It could put you at risk of sun stroke. Located 40 km from Jaisalmer. Shopping : Traditional cotton wear, antiques, leather and silver jewellery can be purchased inside the fort as well as in shops in the town at its base. Tourism and handicrafts are the only two industries in Jaisalmer so bargain, bargain, bargain!